I'm sure this item will take more than a few people by surprise. There will probably be several raised eyebrows, a few double takes and certainly a couple of "what the heck is that" coming from my clientele, as I've never handled anything like it before. It's certainly a departure from my normal fair, but it's easy to explain why it graces the pages of this website. All of us love collecting antique arms and their associated accessories. Over the years, we have all walked up to an item, looked at it, and exclaimed to ourselves, "Wow, I REALLY like this". The first time it happened to me was as a small boy trading a comb, ten cents and a pack of baseball cards for an arrowhead. I still own that arrowhead. The next was my first oval US buckle at age 18. Then, I saw my first Colt Dragoon on Richie Kravariks table at the Mid-America Antique Arms Show in Strongville, Ohio. It's happened hundreds of times since. Now, it's happened again. When I first saw this gun I thought it was beautiful, but that was nothing compared to my impression when I picked it up, "Wow, I R-E-A-L-L-Y liked it!". Nearly three feet long and very heavy, it has a nearly one inch bore, a medieval riot gun if you will. 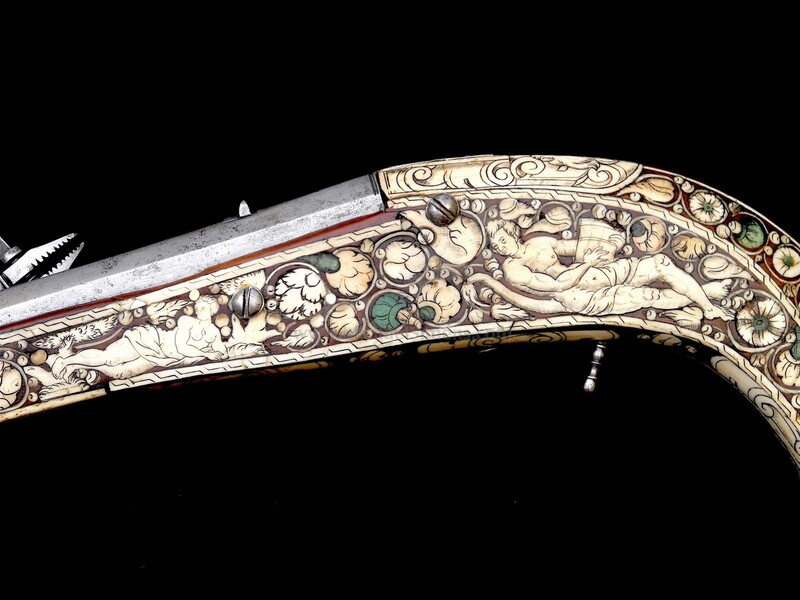 This magnificent gun is the rarest form of all 16th century Wheelocks. As most of you well know, I handle very few items not somehow associated with American history. This is one of those exceptions few for many reasons. For those of you that fancy yourselves as high-end arms collectors, I urge you to take a look at this gun, as well as similar guns that may be offered on the market from other venues. One only needs to acquire a small sampling of such items to complete a worldly collection that spans the ages, and they can be both beautiful and interesting. 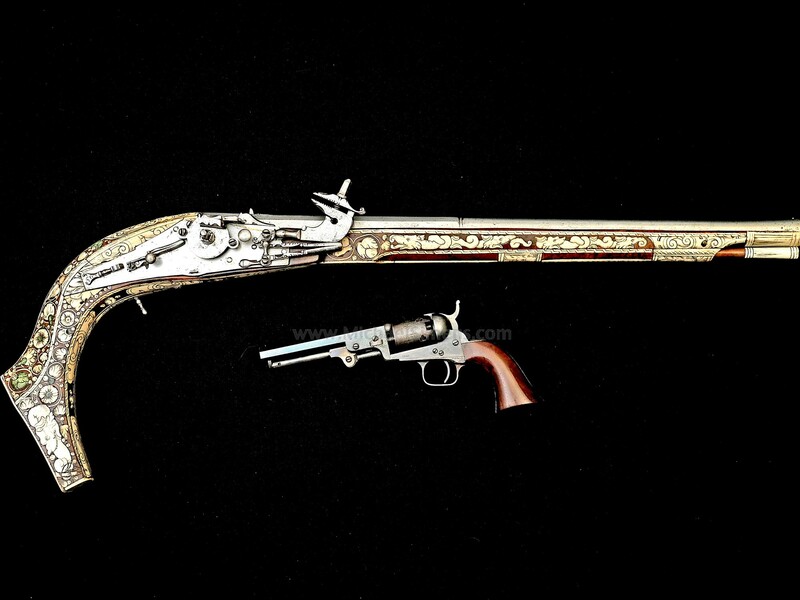 These are the forefather guns that evolved to the Kentucky Rifles, Colt Revolvers and Winchester Rifles that we so love. 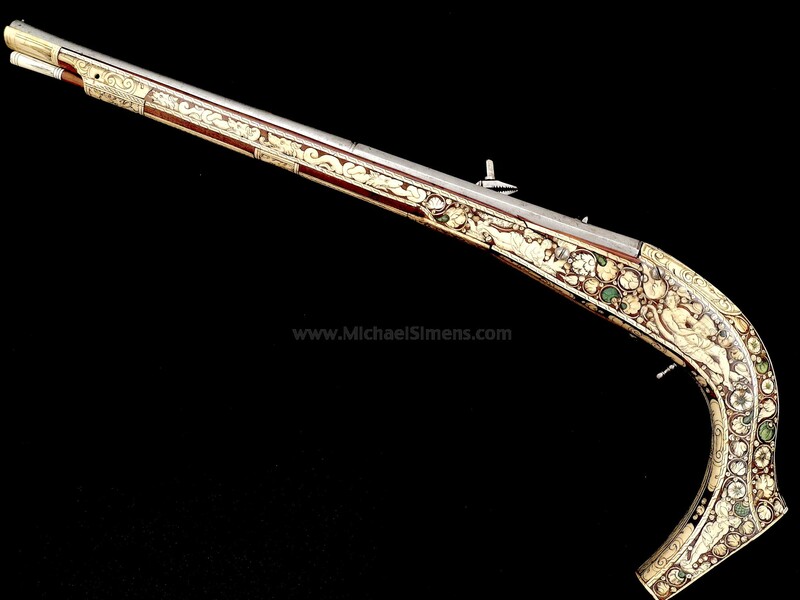 This gun is of great importance as not only an ultimate rarity, but a museum quality work of art. 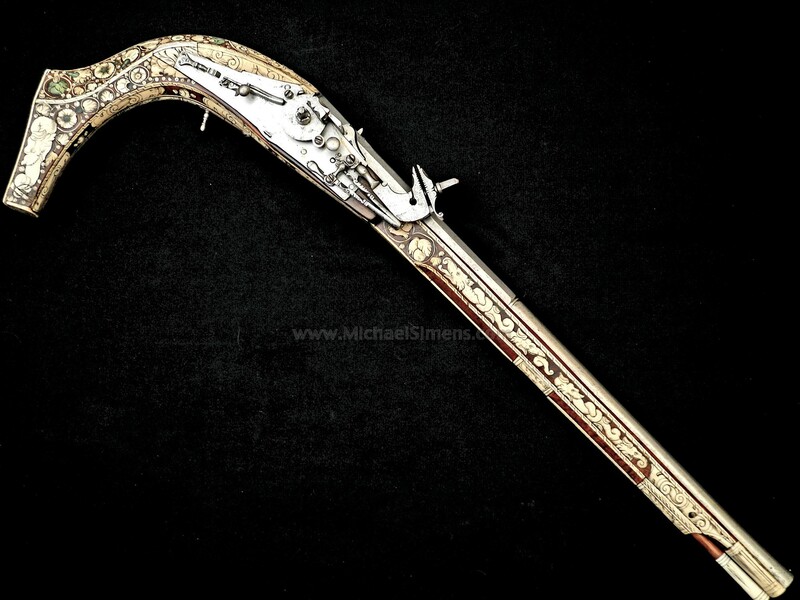 The dramatically curved fruitwood full stock is inlaid with engraved and polished white stag horn throughout its length. 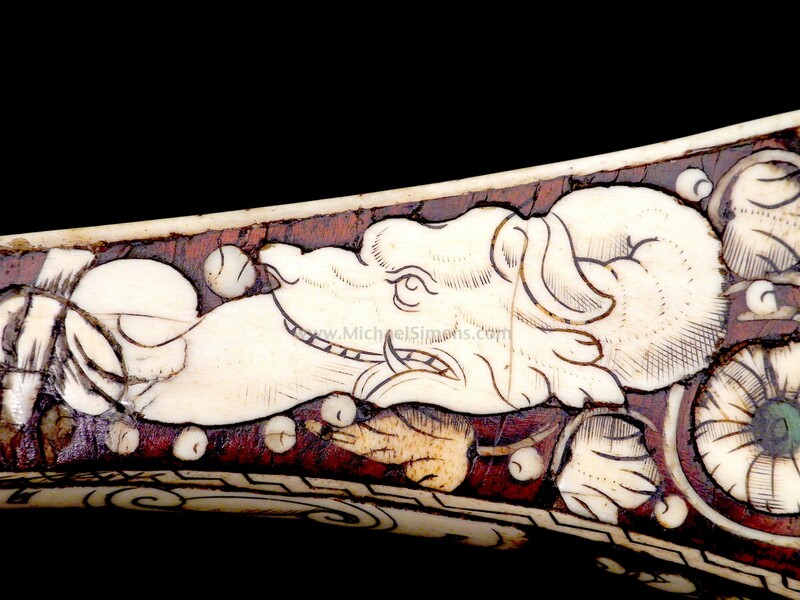 The white horn inlays are finely and richly engraved with scenes of gods and goddesses from classical antiquity, grotesques, scrollwork, geometric bands, and mythical dragons. 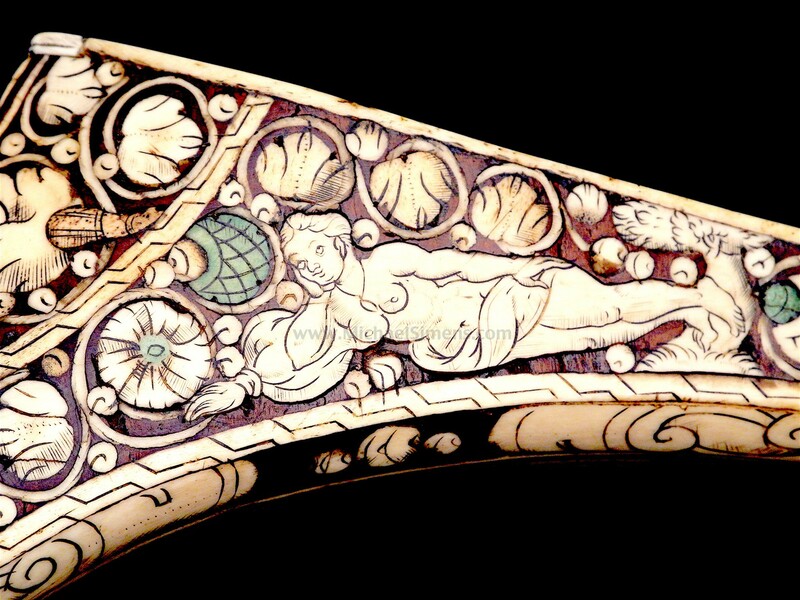 Enhancing the lavish beauty of the white ivory-like inlays are inlays of green stained horn producing an enamel effect known as polychrome. The heavy smooth bore barrel is part round, part octagon and has a slightly swamped muzzle ensuring that this most important Renaissance work of art preserves its original length. The rear sight at the breech is deeply engraved “No, 93” almost certainly a royal inventory or collection number. 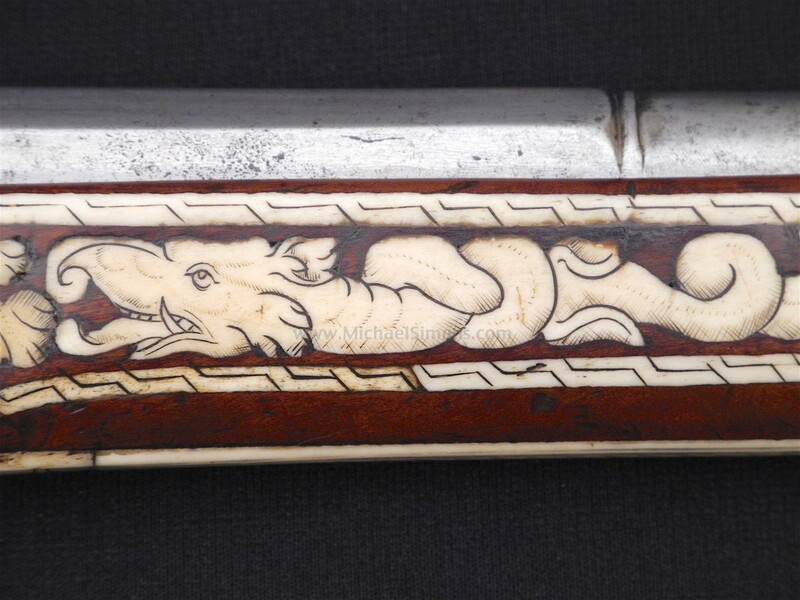 The lock itself is relatively plain and unadorned, serving to focus attention on the incredible artistry of the polychrome inlaid stock. The hammer, spring, and pan cover are chiseled. Baron Frederic Spitzer was the most important dealer in medieval and Renaissance art during the late 19th century. His clients included the Baron Adolphe de Rothschild and Sir Richard Wallace. Many of the finest armor and guns in the Wallace Collection were bought from Baron Spitzer. This superb Renaissance petronel appears on plate 38, number 307 in the catalog “La Collection Spitzer” (3 volumes, Paris 1887) together with the finest Wheelock's by Daniel Sadeler and the Munich Royal Workshops. The British Museum and the Victoria and Albert Museum also have pieces from Baron Spitzer’s collection. There are virtually no Wheelock petronels in American private collections and the opportunity to acquire one with such a distinguished provenance may not come again in our lifetime. The gun is in very good condition. 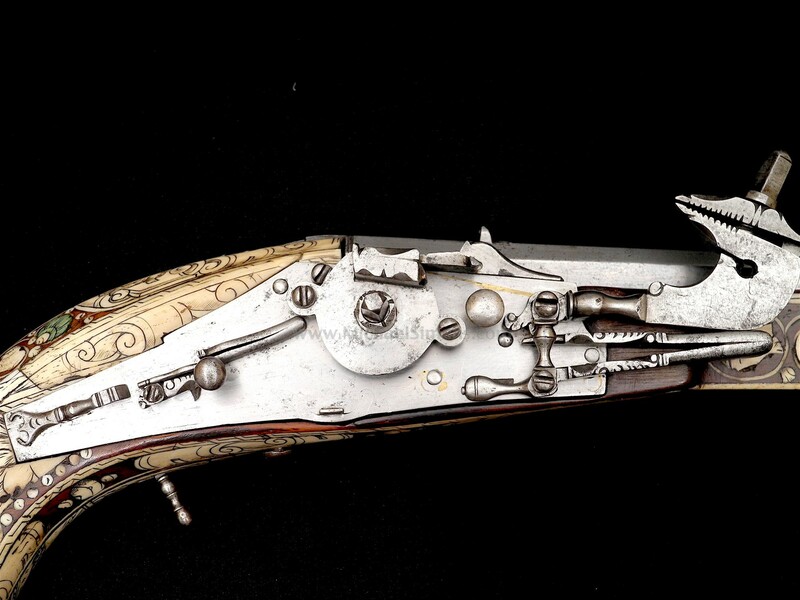 The barrel, lock, and trigger guard are bright steel in the European museum tradition and show scattered mild pitting, which in no way detracts from the beauty of this Wheelock. There is a visible crack through the top tang (see photo). The work of art fruitwood stock has a minor stress crack at one of the lock screws. The polished stag horn inlays retain all of their engraving and are crisp throughout, with two small areas of repair/replacement. It would be difficult to overstate the magnificence and rarity of this work of art in a firearm. It will undoubtedly provide its new owner decades of enjoyment and pride of ownership. LEFT CLICK ANY THUMBNAIL TO ENLARGE. LEFT CLICK ENLARGEMENT TO EXPAND AND NAVIGATE. LEFT CLICK EXPANSION TO REDUCE. HISTORY, AUTHENTICATION, IDENTIFICATION, ESTIMATES AND VALUES.